For other buildings than stores we have the following rules for applying our logo to the facades. Whenever only the JYSK logo needs to be present please refer to the same rules as to normal store fronts in this guideline. In some cases the JYSK logo is not an option due to local legislation or requirements from the building owners. In these cases the preferred option is to remove the blue background in the logo, so that only the goose, “JYSK” and the outline remains in backlit white LED. If this is also not an option the remaining options must be approved by JYSK Nordic Marketing Director. The text should always have the same height as “JYSK” and be aligned to fit top/bottom. 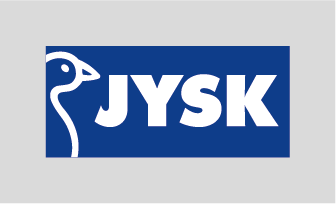 The distance from the JYSK logo to the text is defined by the width of the Y in “JYSK”. If the JYSK primary logo is not an option the preferred option is the JYSK logo without the blue box in backlit white LED. If this is also not an option the remaining options must be approved by JYSK Nordic Marketing Director. For other signs in connection to other types of buildings the same rules apply as to the stores. However when JYSK logo is written together with an additional name or element the primary choice is the primary JYSK logo followed by the subsequent word in black letters on light background or white letters on darker backgrounds. If this is also not an option the remaining options must be approved by JYSK Nordic Marketing Director. Our prefered solution is to have the subsequent word in black letters – But on darker backgrounds the best solution can be white letters. 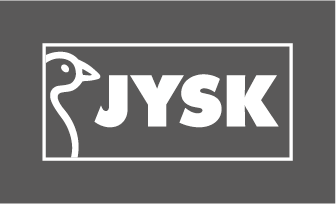 In cases where the background size is predetermined the size of the JYSK logo and subsequent word is defined by either the horizontal or vertical margin which is defined by the letter height in the JYSK logo.